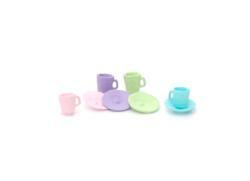 This is a super cute set of 4 cups and saucers. The cups and saucers are separate and can be glued together for any tiny scene. They come on supports so they can be painted easily, then trimmed with flush cutters.